DarkWaterMoon: Was your question ever answered? Is the book released yet? Since no one replied I just thought I would chime in with a useful post.. In my experience all energies carry electromagnetic fluids. So say you are working with the elemental zone of fire (head) you will be manipulating the electromagnetic fluid spectrum of the fiery elemental energies that makes up the energetic structure of the head to create elemental balance in the specific zone. As seen in the chart the majority of the head mass is predominantly electric with some magnetic and neutral fluids within the zone to balance out it out in the left side and back. I suppose one could look at it in sub-element terms. Fire-of-Fire would be the electric fluid within the head, and Water-of-Fire would be the magnetic, while Air-of-Fire would be the neutral, etc. 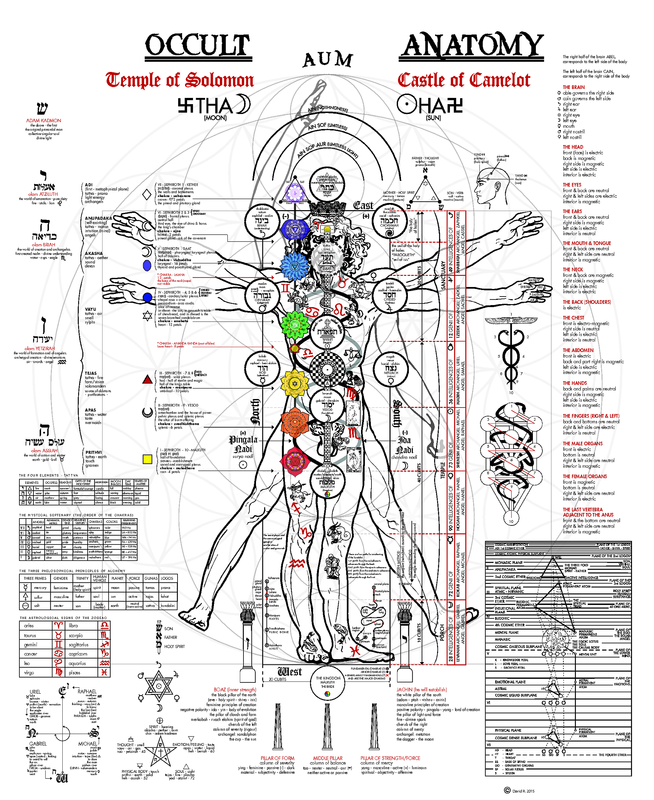 If anyone sees any problems with this outlook on the Occult Anatomy I would love to hear your thoughts. This is a wonderful topic and I'm going to have to come back and study more on this. Our body is our temple, and I believe the secret to greatly extended lifespan is a deeper affinity with and understanding of our body and its various demands. I also like pointing out the fact that, while we think ourselves as a single entity, we actually manifest as a collective of billions of entities working together simultaneously: our cells! And systems, organs, and even several pounds of beneficial bacteria that live in our intestines and help digest our food! The medieval alchemists had meditations for going into the body and building a mental representation of its various parts as a castle, with different rooms of the castle representing different body parts, and so giving us a way to mentally interface with our body. I'm inspired by this idea but would rather think of the different parts of my body as cities! They might as well be, so much activity from so many minuscule parts is always going on within it. Anyway, thanks again for this thread and I'll be coming back here. The critical reviewer is obviously ignorant. I myself am VERY appreciative of Prophecy's post. It clarifies adds much needed information for Bardon students that I have not been able to find anywhere else. When reviewing Bardon’s list in Initiation into Hermetics, around which the given list has been structured, it occurred to me that there was a certain incongruence between my own practices and the positions given by Bardon. This issue was resolved, however, upon a certain realization: that when Bardon provides his list, he does so from the point of view of the healer as opposed to the client. Therein the client’s “left” is the healer’s “right,” and this I believe has caused a great deal of confusion amongst students. With the given list I hope to have somewhat remedied this problem. @Prophecy - can you recommend me some more material or books on this topic where i can learn more about this? Can you give us some example how to define let´s say kidney or liver for example, which part is magnetic, electric or neutral? can you recommend me some more material or books on this topic where i can learn more about this? Can you give us some example how to define let´s say kidney or liver for example, which part is magnetic, electric or neutral? Try to study the subject of Traditional Chinese Medicine, specifically the 12 Inner Meridians and Acupuncture. In TCM, Yin is the Magnetic Fluid and Yang is the Electric Fluid. There really aren't any organs that are "neutral" in that respect, unless I misunderstand your meaning, because each part of the body has a job to do, and therefore each part of the body is either Magnetic or Electric in energetic expression. TCM is a very big subject and it isn't something to pick up as a light hobby, but it's also one of the most thoroughly developed studies of the human energetic anatomy in the world. You can find plenty of detailed answers to your questions and plenty of examples by studying it, and as for books, I highly recommend beginning the works of Dr. Yang Jwing-Ming. His works are not medical texts for the most part, but his work can give you a very gentle and well rounded introduction to the Chinese way of looking at things, and you can use that as a stable foundation upon which to study TCM with educated eyes. @Ekstatikos - thank you for your information about Prophecy..
@Shinichi - this information will be very helpful for me because now I know where to search further. I have just started a month ago with the Qigong and Taijiquan. Thank you very much Shinichi.. Please go to http://imgur.com/a/zBkeT to view the album which contains the drawings I used as reference. All the original drawings were translated from Italian, Spanish, Portuguese, and Hebrew. I translated all originals and cross referenced each to come up with the most accurate translations I could. I spent nearly 3 years on this project.